Many choir conductors will certainly agree that the quality of a choir is often linked to the qualities of the conductor. Thus it is obvious that choral conductors need to command enormous versatility in numerous fields, and the success of their work will increase with each intense study of the most important aspects of choral singing. A long list of the required abilities could be drawn up. One aspect, however, is rarely considered – acoustics, as music is irrefutably based on the laws of physics. Thus knowledge of the natural laws of acoustics can supply choral conductors with important assistance as to how to understand different coherences, and to draw valuable musical consequences from these. In most cases, problems are solved without such background knowledge, on the basis of personal experience or intuitively. This article will attempt to clarify in exemplary form how the knowledge of acoustics can be systematically placed at the service of musicians. Numerous concepts such as frequency, overtones and resonance are common parlance among singers and teachers of singing. They originate from the repertory of the natural sciences and supply a firm basis to a singing practice which otherwise is characterised more by intuition. If, however, we bear in mind the discussions about the evaluation of singing voices and their aesthetic qualities, we find that opinions will differ widely, and disputes will often arise. All too often the reason for this lies in the differing use of acoustic concepts as well as the absence of objective criteria for such judgements. In acoustics as a subsection of physics, the terminology is clearly defined and thus can act as support for musicians. 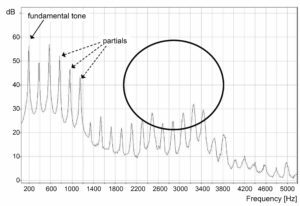 Over and above this, the methods of acoustic analysis offer the opportunity for the development of objective criteria which represent the best possible and necessary complement to long years of experience in singing and pedagogical skills. 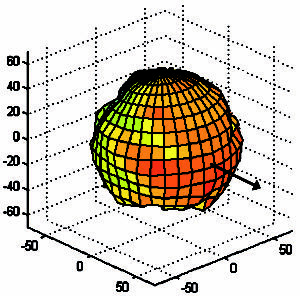 The acoustics of the solo singing voice have been under investigation for many decades, but research into choir acoustics by means of the technical development of systems for measuring and analytical software as well as the necessary and extensive specific knowledge of singing technique, choral conducting, psycho-acoustics, physics, signal theory, techniques of measurement and room acoustics has only become possible, in greater intensity, in the last few years. If we are prepared to simplify slightly, we can envisage the acoustics of the production of sound while singing as follows: the lungs supply the energy so that with the larynx as the source, a primary sound can be produced. The vocal tract which lies above serves as a filter and, according to its shape, the natural harmonics are allowed to pass through this system in differing amplitudes. The lips provide a further filtering within the framework of the propagation of sound, modifying the sound yet again. Because of the acoustic properties of the spreading of the sound as well as the acoustics of the hall, the sound will arrive in any one place having undergone more or less strong changes. The final variation is supplied by the ear and the way the listener’s brain processes the sound to be perceived. In this article the individual aspects of this long change of sound events and sound changes will be presented and placed into a context that can be made use of by choirs in their practical work. 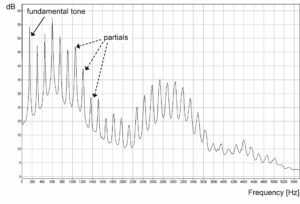 Viewed acoustically we find that the sound produced by an instrument or the voice consists of a large number of partials – also referred to as overtones or harmonics – of differing amplitude. The frequency of the fundamental, identical with the distances of the partials from each other, determines the perceived pitch. It is the relationship of the individual volumes of the partials to each other, also referred to as spectrum – that enables us to perceive the various tone colours. Thus, with identical fundamentals, different instruments and tone colours can be distinguished. The voice – speaking and singing – consists, phonetically as well as acoustically, primarily of vowels and consonants. 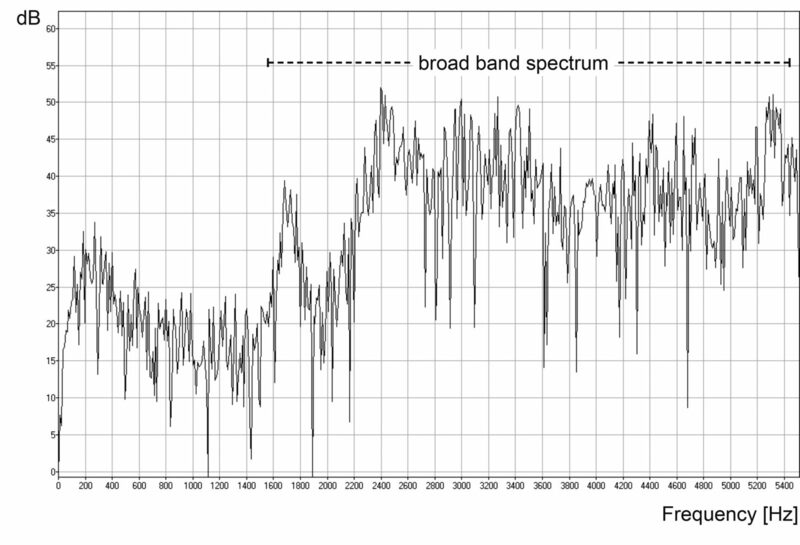 The graph below shows the spectrum analysis of a vowel, showing the distribution of the frequencies for this sound. The vowels are the main carriers of sound and responsible for the beautiful sound of a voice, and for the volume. The spectral analysis shows the fundamental with numerous overtones. The power of the sound of the vowel and thus of the voice lies within the lower range of the frequency. Thus we find that for singing, those overtones which lie within the area of the respective vocal formants are stronger. Therefore, in a choir, one of the factors determining intonation within the vocal sections will be the identical formation of vowels – vocal formants as similar as can be achieved. When in choral singing it comes to intervals and chords, the decisive factor for good intonation is the similarity of overtones and vocal formants. Every anatomical change of the position of tongue, soft palate, placing of the larynx, opening of the mouth and the lower jaw leads to a change of the entire vocal tract. These changes take place at phonetic events and, in speech, follow on each other very quickly. It is possible to explain, and to apply in a differentiated way, some of the aspects which are relevant to vocal training, such as placement of voice, projection, volume, vowel equalisation, amplification and overtone content of the voice, using this acoustical angle. For example, in vocal training, the so-called vowel equalisation (or assimilation) aims at blending the vowels more strongly with each other and thus giving the voice a clear uniform tone colour independent of the colour of the vowels. Acoustically the first vocal formant depends strongly on the position of the jaws, the second primarily on the position of the tongue. Thus vowel equalisation is achieved by varying the position of jaws and tongue, either simultaneously or independently of each other. This explains the differing methods employed in vocal choral training which are based on changes in the position of lower jaw and/or the tongue and aim at achieving a balance between keeping the vowel recognisable and the voice homogeneous. As this separate guidance requires much practice, this is of particular interest for solo singing as well as for choral work. The projection of the singing voice is of particular interest, both for solo and choir singers. 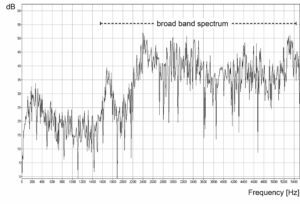 In this context the frequency area between 2000 and 4000 Hz deserves particular attention. This area, also known as the “singer’s formant”, indicates the clear raising of volume within the overtones found at these frequencies. 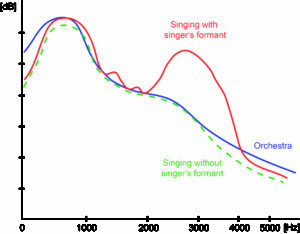 Closely connected to the singer’s formant is the concept of the placement of the voice, an important topic in vocal training, for an improvement in this results in a reinforcement of the overtones similar to the reinforcement supplied by the singer’s formant. These graphs clearly show the raising of the 11th to 15th overtones in a note sung with singer’s formant compared to one sung without it. If we apply this to choral music, we find that the development of singer’s formants and the placement of the voice that goes hand-in-hand with this can also be of importance. It can supply greater brilliance, clearer text and more transparency. Furthermore it can offer a greater dynamic range in return for comparatively little exertion on the side of the singers, serving to make the singing sound resonant and natural. The next graph illustrates the average spectra of an orchestra and of the voice. We see that there is a large range of frequencies where the voice is no louder than the orchestra. 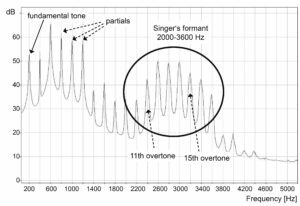 It is only in the frequency area of around 2000 till ca 3200 Hz that the overtones of the voice are louder than those of the orchestra. This is why it is possible for a singer to be heard across so many instruments in the first place. Here, too, it should be noted that the ear finds the overtones in this area of frequency sufficient for the recognition of the fundamental. As the distances between the overtones are of equal distance and match the frequency of the fundamental, the ear is able to allocate the pitch without ambiguity. In choral singing we often encounter the situation of a singer who has had singing lessons and is thus already capable of using the singer’s formant. This is why it will be possible to hear them above the rest of the choir. Alongside the widespread aim of choral conductors to cover the better trained singers and thus ask them to use less singer’s formant, there is also the other, more sustainable though possibly more labour-intensive strategy of leading all the other singers towards singing with singer’s formant. The advantage of this procedure is a clearly increased dynamic range of the choir and a brighter, more flexible and fresher sound of the choir. As opposed to the vowels and the sounds linking them, unvoiced consonants are produced without the involvement of the vocal cords, primarily by friction and diffraction of the airflow at the points of articulation. Because of this toneless and thus unperiodical production of sound, they possess a spectrum distributed widely across all frequencies, with its main energy usually situated in the higher ranges of frequency up to around 12 000 Hz. Voiced consonants and nasal sounds produce hybrids of periodical and unperiodical forms of vibrations, with an overlap between the respective shares. Thus, in a sung melody, we find, alongside the path of the fundamentals and the changes of overtones pertinent to these and also depending on the text, numerous spectral changes, depicting a spectral development in the course of time. Thus it is the consonants that supply the meaning of the text by separating and structuring the sounds of the vowels. Thanks to the broad range of frequency they arouse in the ear, and to their higher energy, consonants are usually perceived quite strongly. This explains the phenomenon in choral practice that consonants which are not precisely synchronised are clearly noticed and irritate. A strengthening of the consonants is bound to drive this problem home to the amateur choral singer, but it will lead to an imbalance against the volume of the vowels. As the energy of consonants is quite high anyway, surely their normal, well-synchronised articulation will suffice, something that can be achieved by sensitising the choral singers as well as by relevant precision on the side of the conductor. Another important factor, apart from the quality and the sound of singing voice, is the transmission of sound from the choral singer to the audience in the rehearsal room or the concert hall. The main responsibility for this lies in the manner in which the sound leaves the singer, and in which directions, and with what intensity, this diffusion takes place. This so-called “directivity” describes a property of the singer which depends solely on the geometry of the body and the acoustical character concerning absorption and reflection of that body. Lips, nose, ears, head, shoulders and the entire upper body modify, reflect or absorb the sound in different ways for every frequency. For every frequency of a sung note, i e for the relevant fundamental with its overtones, we will find a different behaviour as far as propagation of sound goes, as can be seen in some exemplary graphics, below. 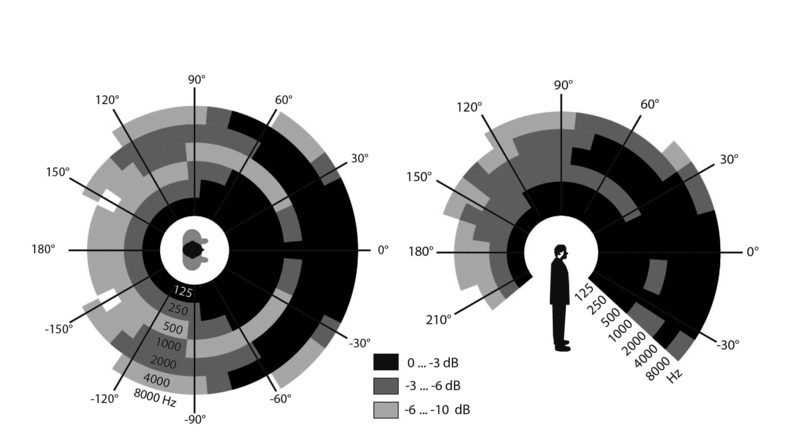 These graphics use spherical diagrams in order to depict the behaviour of sound around a singer. The pressure of sound is expressed in decibels (dB), a physical measurement which matches the approximate volume at which the listener perceives it. The power of propagation is depicted on the one hand in deviations from the spherical geometry, on the other by varying colouring on a sliding scale: red stands for strong propagation, blue for weak propagation. The way a singer is facing is illustrated by arrows. The propagation behaviour of three partials of the spectra discussed above are represented here in an exemplary fashion. The propagation is shaped very nearly in the form of a sphere, i e this partial is being diffused equally strongly in all directions. We are familiar with this effect from the subwoofers of our domestic stereo installations, the position of which in the living room can be pretty much anywhere, because in low frequencies, the characteristics of diffusion from any source of sound are usually spherical. This graph already allows us to discern a propagational behaviour that is clearly different. 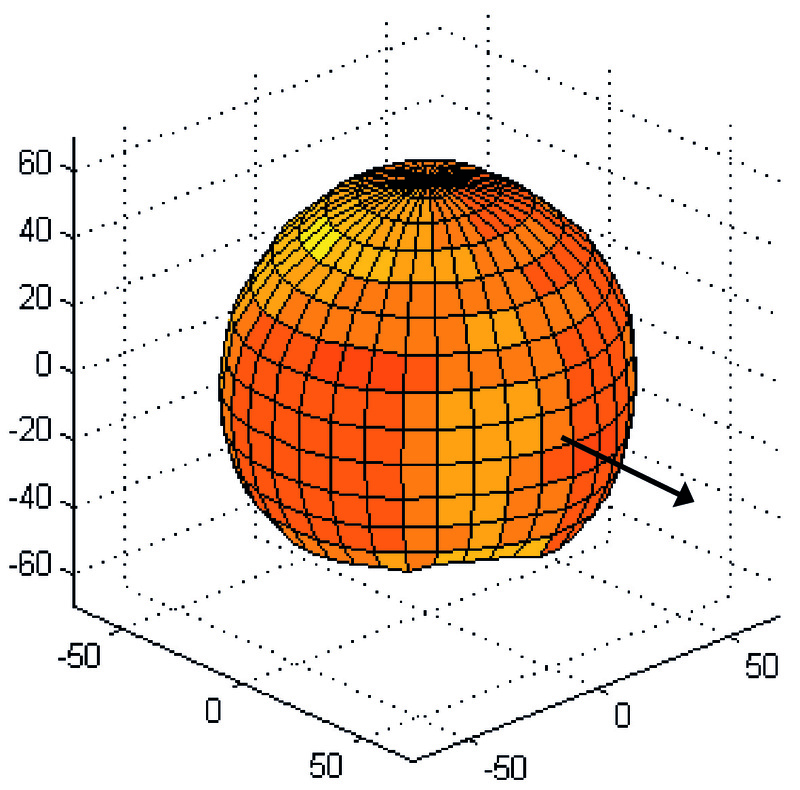 A stronger directional effect towards the front half-sphere becomes apparent. 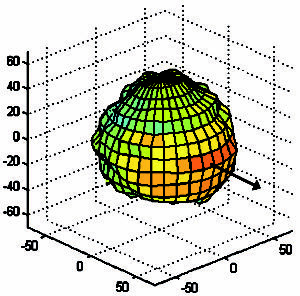 However, the strongest propagation is not directed exclusively to the front, but slightly sideways or upwards. 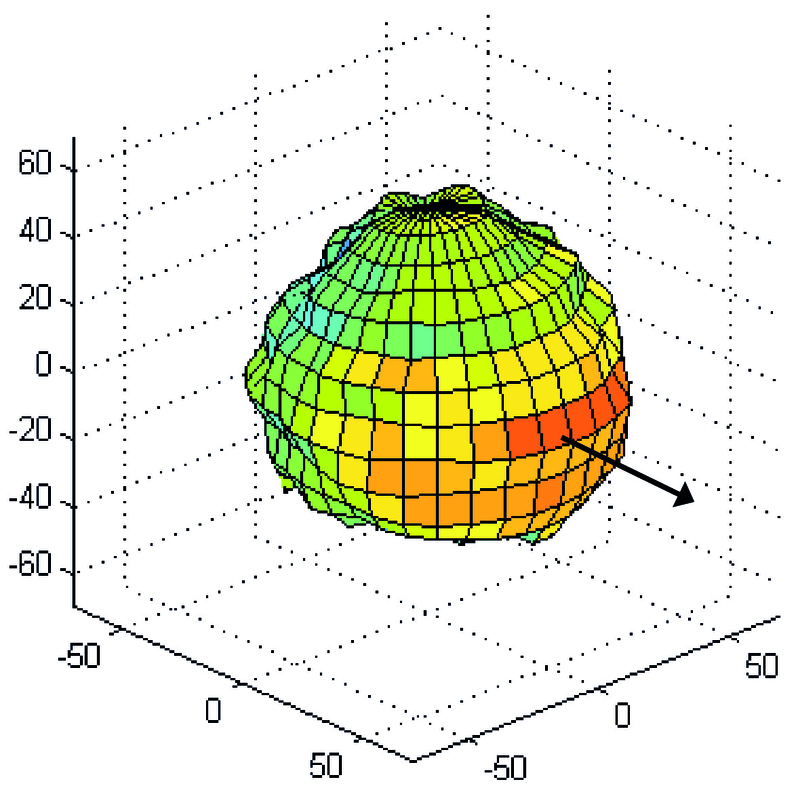 The Propagation towards the back and to the lower sides is clearly less. We know this effect from singers or speakers whose sound of speech or singing varies, depending on which side is directed at the listener. The main propagation is directed more strongly to the front, with some tendency downwards, with an effect that is very broadly orientated towards the sides. Towards the back of the singer we can see that there is by no means no propagation any more, but – against expectations – this is in part even stronger. 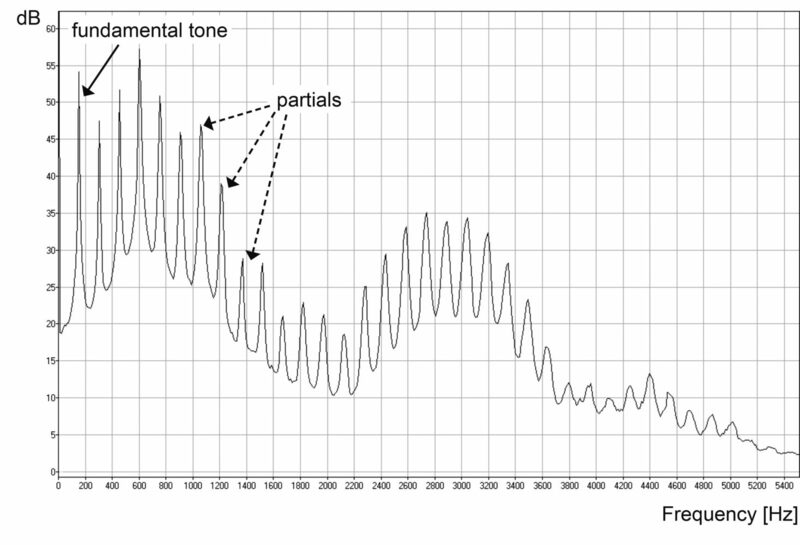 The behaviour of propagation illustrated here in respect of three partials can also be found in other partials of the vocal spectrum and has an effect on the entire sound, depending on the strength of the overtone. 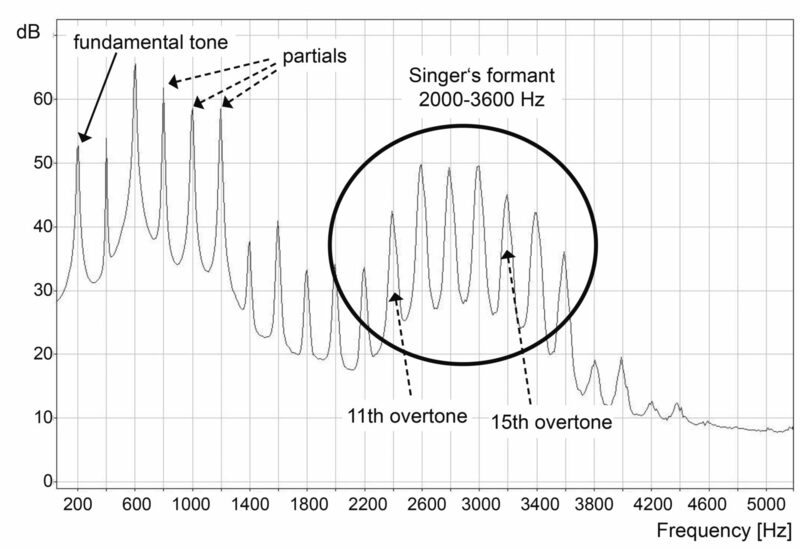 Particularly in the range of the increased singer’s formants between 2000 and 3600 Hz clear directional effects can be noted. The more strongly the directivity is guided towards the front, the better the sound will carry, and the more resonant the sound that will be perceived by the listener. This underscores the crucial importance of the singer’s formant yet again. An optical depiction of this diffusion can be hinted at by means of the next two graphs showing the propagational characteristics in two levels, seen from the top and from the side. The frequencies supplied refer to the centre frequency of the respective mean values within the range of an octave. 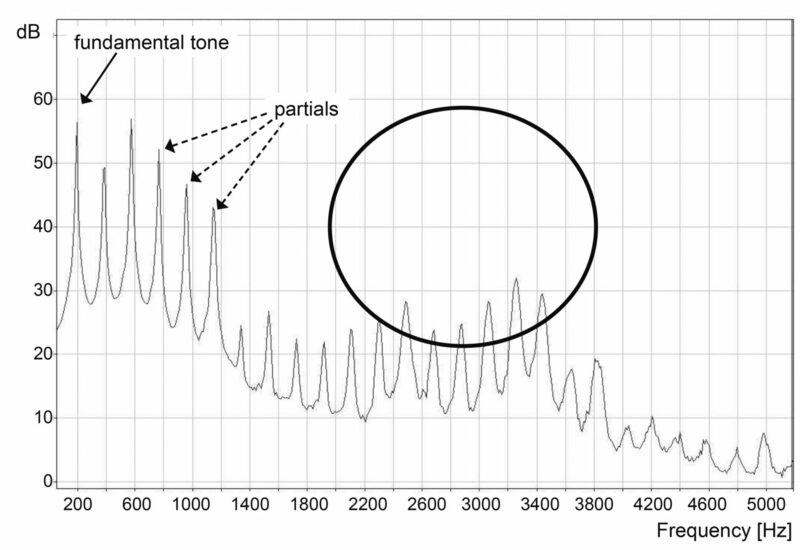 The areas show the reach of the main propagational areas of the singing voice: dark grey areas describe a decrease in relation to the highest level [in that colour band] of 0 to -3 dB, grey from -3 to -6 dB and light grey from -6 to -10 dB. Areas left uncoloured possess higher decreases of volume than -10 dB. We can sum up the propagation of sound for singers as follows: in the lower frequencies of 80-500 Hz the propagation is nearly spherical. Thus, for these frequencies, the direction in which a singer faces is negligible. In the middle frequencies of 500-2000 Hz the propagation is mainly directed to the front and downwards; somewhat higher frequencies result in stronger propagation towards the top left and right with a reduction towards the back. However, at the back of the singer there exists a local maximum due to constructive interference. In the high frequencies of 2000-5000 Hz we find that, apart from the strong diffusion towards the front, a considerable proportion of the energy is also emitted towards the right and the left; the propagation to the back is much decreased. Reflection: large obstacles throw sound waves back, the angle of reflection being the same angle with which the sound met the obstacle. Absorption: when a sound wave meets an obstacle, its energy is decreased during absorption. This loss of energy differs greatly according to the frequencies and depends on the acoustical properties of the obstacle. Diffraction: sound waves encountering obstacles may also experience a deflection in the direction of their propagation. This peculiar phenomenon of waves is again strongly linked to the frequencies and operates to differing degrees, depending on the relationship of the size of the wave to the size of the obstacle. Due to the laws that govern the propagation of sound, we will find certain acoustical characteristics in concert halls, churches or other musical spaces. This space-linked acoustical outcome depends on the position of the source of sound (e g choir) and the recipient of the sound (e g audience). The principle of this link between sound and space will be briefly explained using the graphs below: initially the sound of a singer reaches a member of the audience directly through the air. Further sounds follow, slightly delayed after having been reflected on ceiling, wall or floor. These form the early reflections. As the sound may even be reflected several times, the sound of the choral singer will also reach the listener with a distinct delay; the sum total of these sound events is called reverberation. The duration of this reverberation depends on the speed with which the sound loses its energy within the hall. Size of the room: rooms with a large volume possess a long reverberation, reduced by the absorption of the surfaces. Due to the large distances the sound energy and thus the perceived volume are considerably reduced for those listeners seated far away. Furthermore, due to the comparatively slow speed of sound (sound travels 40 yards in about a tenth of a second) there can be differences in the arrival times of the original sound and various reflections. This leads to lack of clarity and annoying overlaps. Even in small spaces inappropriate reflections may make clear inroads on the degree of understandability. Shape: shapes of rooms are to be preferred in which the sound reaches the listener in as direct a way as possible, without having been strengthened or weakened by reflections. This helps the listener localise the source of the sound. However, in many churches there are numerous round surfaces which reflect the sounds from all their sides towards the centre, for example in the apsis of the church, vaults or a chapel. This results in unpleasant interferences or time delays, irritating the listener. Acoustic properties of the surfaces: hard and smooth surfaces reflect very well, thus it will take quite some time till the energy of a sound wave has died down, leading to long reverberations and, in churches, making the sound feel loud. Open-pored surfaces and so-called “sound-soft” surfaces like textiles have the effect of swallowing sound. If people are present, these, too, influence the acoustic of the space, by absorption. By changing these surfaces, clear differences can be made to spaces. Soft and open-pored materials like cushions covering the full length of pews transform a noisy church into a quiet one. Position of the sources of sound: sources of sound will be reinforced if they lie immediately in front of a reflecting surface. The further the source of sound is away from the wall, the less strongly it will be supported by reflection, and the larger the time lag between reflection and direct sound. Volume, immediacy and transparency of the music can thus be varied simply by the position of the sound sources in relation to walls. Another important aspect is the connection between the choir and the space in which it performs. In this in particular we need to distinguish between the audibility of the singers within the choir on the stage, and the perception of the listeners in the auditorium, which both depend on the acoustic of the room. This is predetermined as an acoustical system by the geometrical and acoustical properties of walls, ceiling, floor or large objects within a rehearsal room or concert hall. Thus the directivity of singers and the varying positions of the choir singers on stage possess an important influence on the audibility of the other singers as well as on the overall sound reaching the audience. Every singer is a source of sound which can be reflected within the acoustical system or even be modified by objects. All this depends very largely on frequencies and thus determines the distribution of energy within the space. We can make a rough differentiation between the area immediately surrounding the singers and the larger area, more distant, depending on how high the proportion of the singer’s sound is that is transmitted directly to his/her fellow singers, and to the audience. In a room with much reverberation and repeated reflections from the walls, the near field around the singers is fairly small, which means that even if the singers stand with little distance between each other, their fellow singers will find themselves in the far field category. This means that the singers, no matter where on stage they are positioned, will have a similar impression of the choir over all, and the way they are arranged will have less influence on audibility, nor will the formation of the choir make more than a trivial difference on the sound reaching the audience. Surely every choir has experienced the impression that, in an “echoey” church, it is very difficult to localise other singers from their voices. In a “dry” room with little reverberation each singer’s personal space is clearly larger, and placement and arrangement of a choir, as well as the distances from one singer to another, may make a real difference on audibility. This improved audibility of the singers amongst each other thus also results in an improved overall outcome for the listener. With positioning we usually describe the arrangement of singers within a vocal section. Here we find differing approaches and philosophies. Some choral conductors prefer placing singers with similar timbre and volume as close to each other as possible. Others try to avoid just this positioning, alternating different timbres, so a certain degree of blending takes place and the voices gain some similarity. Here we need to bear in mind the problem caused by the fact that singers with similar timbre clearly find it harder to hear the other voices singing the same parts. If we don’t watch this problem, there could be unfortunate consequences concerning intonation and dynamic balance. Another important group of criteria concerning positions of singers within a choir, which we will, however, not discuss here, consists of the human and social relationships among the members. Formation refers to the way the vocal sections are arranged. In this respect many countries have certain traditions which surely arise largely from the preferred literature. Then we need to bear in mind even practical aspects such as the height of the singers, who all need to be able to see the conductor easily. The size of the various vocal sections, too, will militate in favour of certain formations. The table below presents three quite popular formations with some of their advantages and disadvantages. The spacing between the choral singers is often not given any thought. For one, the distance has an influence on the volume a choral singer produces in relation to the rest of the choir. Here there exist certain volume balances which are favourable for the choral singers – others are less so, strongly dependent on the surrounding space. And then deliberate use of distances can achieve a different sonority for the listener. The acoustics of a choir within any space are the result of the sound production of each individual singer, the propagation, the acoustics of the hall and the arrangement of the choral singers within it. Thus, summing up, we can state that the formation and arrangement of a choir is an artistic means towards the realisation of a sound vision which every choral conductor can consciously employ, and for which decisions need to be made. The formation of choirs is not so much a given to which every choral conductor has to submit. After its already quite complicated route through the hall, the music will reach the ear of the listener in the audience. Depending on this position impressions may differ considerably. Thus the ear represents a further filter for “translation” or rather interpretation by the brain in different ways, and which is finally conceived by the listener as sound. Furthermore it needs to be mentioned that the ability to hear exerts an important influence on the perception of the sound of a choir. With age the ability to perceive higher frequencies diminishes, meaning that consonants are heard less strongly and possibly the meaning of the text is no longer understood, though the vowels are still heard loudly. The arrangements and formations described above are crucial for the situation of a choir within its space, and important for the listener within the audience. Recordings, be they of live performances or prepared in a studio, obey different laws, as now the ears of the listeners seated far away in the auditorium are replaced by the main microphones and possible secondary ones, too, so they will feel distinctly closer to the choir. Thus the strong effects of the side walls and their qualities of reflection are absent, and we find a very different acoustical situation. The acoustics within a choir consist of a complex system of numerous parameters which influence each other. Apart from the pure production of signals by means of the larynx with the vocal tract as a filter, the human voice undergoes a further, variable propagation depending on frequencies, and through directivity. Furthermore the position on stage and the positions of the choral singers within the choir influence this propagation; additionally, the degree to which the choral singers listen to each other is clearly influenced by their relative positions to each other as well as by the surrounding space. The further spread of the sound within the space is governed by the acoustical geometry of this space, and by its acoustical properties. The listeners’ perception is subject to another filter of acoustical laws but also to subjective judgement.